If you’ve seen the TLC show, My Strange Addiction, you know that some people are so obsessed with inanimate objects, they actually “marry” them. If I were a total weirdo and I had to choose a bizarre “partner,” I’d marry chocolate. 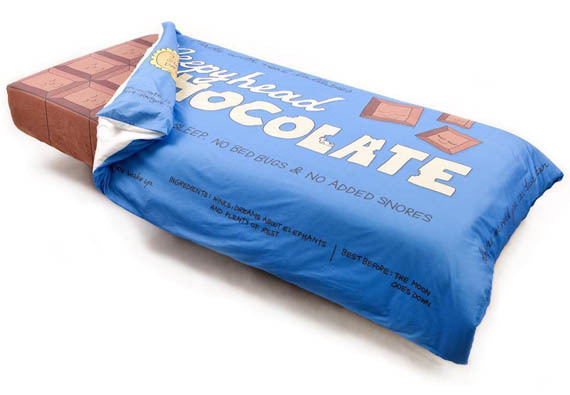 Since I already have a human husband, I can settle for a set of Sleepyhead Chocolate Bar Bedding. Yup, with this bar-in-a-bag you can snuggle up with chocolate each and every night. The Chocolate Bar Bed Toppings are made with 200 thread count cotton and each set includes fitted and flat sheets, as well as pillow cases, featuring the candy pieces, while the blanket serves as the bar’s wrapper.